Editor's note: This feature was originally published in 2013. Roll up your sleeves and get your hands dirty. 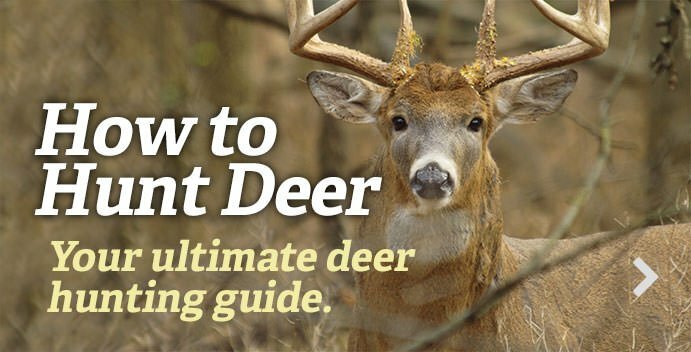 Here’s the complete guide to field-dressing, skinning, quartering and cooking that deer you just killed. You’ve put in your time, made a good shot, and finally killed a deer. Now the work begins. The best way to learn how to process a deer is to roll up your sleeves and get started. The end result will be a freezer full of tasty venison—and a clear reminder that McDonald’s hamburgers don’t grow on trees. But having a good reference helps, and that’s what we’ve created with this guide. Field-dressing, or gutting, is the first step after the deer is down. A deer’s internal organs need to be removed as quickly as possible for a variety of reasons. Opening the chest initiates the cooling process and gets the internal organs away from the meat, a critical step in slowing bacteria growth and keeping spoilage at bay. The blood and gut pile will comprise 20 percent or more of a deer’s weight, too. That’s handy to know when you’re faced with a long, uphill drag. The field-dressing process is pretty simple, and messy enough that showing it on outdoor TV has long been taboo. But we’re going to show you every step right here because hey, that’s real life. With practice, you can complete this chore in a couple minutes. But there’s no reason to rush. Watch the video below, and visit our Timber 2 Table blog for further written instructions. I like a fixed-blade best for field-dressing. One with a stout spine and a non-slip handle, as the knife will be soaked in blood by the end of this task. A gut hook is handy for slicing through the skin without hitting the stomach, but not a requirement. A straight-back blade style allows for good leverage when prying through the rib bones. I’ve carried Buck Knives since I was a kid, because that’s what my dad used. Buck blades have notoriously hard steel that takes a while to sharpen, but they hold an edge incredibly well. My blade of choice for field-dressing is an Omni Hunter 12PT. At the end of this task your hands will be, well, messy. Grime Boss wipes stash easily in a pack and are perfect for cleaning up your hands and knife in the field. Field-dressing is the messiest step, but also the quickest. Skinning a deer is a bit more tedious. Though I’ve skinned deer on the ground and on the tailgate of a pickup truck, the chore is far easier—and cleaner—if you can hang the deer first. Most people skin their deer hung from the back legs on a gambrel. That’s what’s shown in the video here. But that’s not the only way to do it. If you’re in the field and don’t have access to a gambrel, you can hang a deer by the neck and skin it that way just as effectively. That method even offers some advantages when it comes time to quarter the animal and get the meat on ice. Regardless, the principle steps for skinning a deer are the same. Initial cuts are required around each leg, usually at the knee joint. You’ll also need to make cuts along the interior of the legs to connect them with your field-dress cut across the chest. On a deer hung by the head, you’ll need to make a cut either on the neck or around the shoulders, depending on how much neck meat you want to save. From there, skinning the deer is simply a matter of working the hide away from the muscle with the edge of your knife. Watch the video below, and visit the Timber 2 Table blog for detailed written instructions. Good knives will be a part of every step in this guide. Your field-dressing knife will probably work just fine for skinning, provided it’s been cleaned and sharpened. But a gut hook is even handier for skinning because it allows you to make those cuts around the legs within seconds. I personally love this PakLite set from Buck because it includes a dedicated gut hook, a skinning knife, and a small caping knife when you’re caping out a big buck for the wall. I use this set both for skinning and for quartering, the next step. Quartering a deer isn’t difficult, but it can be intimidating. Because of that, mistakes are often made. With some basic anatomy knowledge, you can take a deer apart with a sharp pocket knife in a few minutes, but many hunters ignore that and instead tear into the deer’s bones with a saw. That step throws bone fragments into the meat, and is definitely one of the worst offenders for making venison taste like hell. Each of the deer’s legs are held together by ball-and-socket joints. Once you learn where these joints are, removing the legs is simply a matter of slicing away the muscle and separating the joints with your knife blade. It’s amazingly easy to do … once you’ve done it a time or two. Remove the backstraps along either side of the spine, and the tenderloins from inside the deer’s rib cage. The neck meat can be sliced away from the neck, similar to the backstraps. The remaining stuff—ribs, flanks, brisket, etc.—can be trimmed away for the grinder or for jerky. Watch the video below, and visit the Timber 2 Table blog for detailed written instructions. When the quarters are cut free, they need a place to go. One of the best ways to age deer meat is in a cooler of ice. The cooler needs a drain plug, though, angled slightly downhill. This will purge bloody water out of the meat. A top-quality cooler, like a Grizzly, is expensive but keeps ice for days. Your field-dressing and skinning knives work just fine here, too. But by this point, you will need to re-sharpen them. I like a two-sided diamond stone best, but a smaller pocket sharpener is handy for touching up the edge during the skinning and quartering process. The USDA evaluates the quality of American beef on a scale that measures the flavor and tenderness of the cut. Generally speaking, the cut can receive one of three quality grades: Prime, Choice or Select. The grade is based mostly on the amount of marbling—or fat—within the meat, but other factors including the cow’s age and diet also come into play. Venison is virtually impossible to evaluate on the same scale. Although there are a variety of things you can do to help the flavor of your venison, deer meat is always lean. The very best cut of backstrap will look much like the very leanest USDA Select cut of beef. Venison is low-fat. That’s part of the reason why we love it. But not every cut of venison is the same. Some are succulent, tender and rich—perfect for a hot grill grate or pan-frying. Others are a little thicker, a little tougher, but tasty nonetheless. They’re excellent slow-cooked on a smoker or in a crock pot. And quite a bit of a deer is full of sinew and difficult to trim—but it makes excellent ground meat for chili, burgers and summer sausage. Our Timber 2 Table blogger Michael Pendley included a few of his favorite venison recipes for some of the cuts shown below. These taste great, but they’re just a scratch on the surface of the options to get you started. The great thing about processing your own deer is that the end product is the very definition of your own. Cooking it is much the same. But check back frequently to our Timber 2 Table blog for more tasty venison recipes. Some classics. And some that haven’t been invented yet. In addition to the round roasts, the ham has several smaller roasts that, while not ideal for steaks, are excellent when ground into burger or used for a variety of slow-cooker recipes. These roasts are full of inner connective tissue that makes slicing them into clean steaks all but impossible. The tip roast is the largest of them (it’s only slightly smaller than a round roast), but there are a couple smaller roasts that fit the description as well. Check out Michael Pendley’s recipe for pulled venison tip roast sandwiches. Most of your venison steaks for the grill and skillet will come from the backstraps or one of the two large round roasts within the ham. Both the top round and bottom round roasts are large muscles that are generally free of inner connective tissue. The procedure for trimming these roasts into steaks is pretty much the same as trimming the backstraps into steaks. The outer side has the thickest layer of fat, so you can simply slice individual steaks away from that (a fillet knife is best), and then trim them individually. A properly trimmed ham steak will be almost indistinguishable from the best piece of backstrap. This video shows you how it’s done. The largest quantity of top-shelf venison steaks and roasts will come from the ham. The shank, which is essentially the deer’s calf muscle, is good for either braising or grinding. The upper portion of the ham can be de-boned into a few major muscle groups, each of which are suited for a different use. The round roasts, for example, are perfect for slicing into steaks. The sirloin roasts have sinew and connective tissue throughout, so they’re better for slow-cooking recipes or even for ground meat and jerky. The shoulders are more difficult to prepare than the hams because they’re full of connective tissue, but they’re very tasty nonetheless. I often debone the shoulders from larger deer and grind them into burger. But they’re perhaps the best part of the animal to cook all day in a smoker—particularly if you’ve killed a younger, smaller deer. Michael Pendley shows you a recipe here that you can use at home to cook fork-tender barbeque venison. The true tenderloins of a deer are located inside the rib cage, just above the hips. Though these succulent strips of meat are tasty regardless of how they’re prepared, it’s nearly a sin not to cut them into thin slices and fry them in hot oil. They’re excellent on a biscuit with eggs over-easy. Check out Michael Pendley’s recipe. Overrated? Not at all. There’s a reason Realtree.com’s deer blog is called Brow Tines and Backstrap. This is the quintessential cut from a deer. It’s easy to trim, easy to cook, and almost universally delicious. Simply fillet the succulent steaks from the fatty outer layer of tissue and slice them to the desired thickness. Steaks for the skillet need to be about a half-inch thick. Steaks for the grill need to be ¾ to an inch thick. You can even leave a chunk of backstrap whole to stuff, wrap in bacon, and grill or bake as one continuous cut. It’s food fit for a king, and a meal hard-earned because hey, killing your own dinner is a lot of work. The neck, the rib meat, the shanks, the flanks, and every other conceivable trimming from a deer can be used. Getting at all of it is work, no doubt, but that’s maximum use of your hard-earned deer. Though I’ve heard tales of smoked deer ribs and tender neck roasts, I’ve always found these cuts to be best used for hamburger, stews, and jerky, simply because they tend to be thin, stringy, and full of sinew. The bottom-of-the-barrel stuff can be boiled and fed to your dog—I know my hound loves it. I’ve been using a Weston grinder, sausage stuffer, and dehydrator for several seasons now, running through five or six deer per season. I’ve yet to have that first hiccup. This stuff is built tough. Must-haves include a grinder and vacuum sealer, but a meat slicer is next on my personal wish list. For trimming purposes, nothing beats a sharp, flexible fillet knife, the very same kind you’d use to clean fish. This propane unit might not be your full-time at-home grill, but it folds up for easy transport, has two burners and delivers 20,000 BTUs of cooking heat. That’ll work just fine for playing chef in camp. Of course you need this. And camo oven mitts, too.